I’m a recipe guy, which if you have ever met me for more than two minutes, you would know that about my personality. By the book. Follow the directions. Play it safe. In more areas of my life than just cooking. As I continue to push myself culinarily, I feel one major thing that’s holding me back is my insistence on sticking to recipes. I think it comes back to my thought that until I develop a solid foundation based on the wisdom and experience of others, I shouldn’t try to branch out and do my own thing. I’m currently trying to break that thought process, slowly but surely. 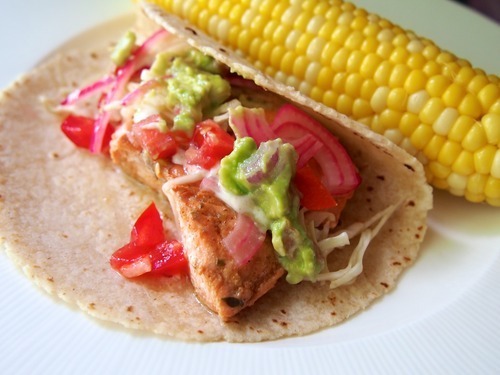 Today I made Coho Salmon fish tacos, and didn’t follow a recipe. I know, big deal, right? But for me it’s a big step. Time to play around with some things. I bought the salmon on special at Harmon’s (great deal at $6.99/lb). I figured the salmon would need a bit of a kick. So I decided to marinate it in some olive oil, lemon juice, cayenne, chili powder, cumin, and a bit of oregano. The marinade was a success. I thought I’d experiment with various slaws. I made a “fake-oli” by mixing Mirin with some Mayo. Turned out ok. I made another simple fake-oli by mixing some cumin, lemon juice, and mayo. That one turned out pretty good. I probably should have added some cayenne for a bit more kick. Mixed both of those with cabbage to top the tacos. I also did a light pickling of some red onion in some apple cider vinegar. I would have preferred using red wine vinegar, but didn’t have any, so plan B. These turned out really good. I pickled some cabbage in a mixture of rice vinegar, soy sauce, and some sugar for a tangy/sweet taste. Salmon was cooked in my cast iron skillet in the oven (cooked it for a bit too long so it dried out). I made a guacamole with cut up avocado, some finely diced red onion, tomatoes, salt, and lime juice. All-in-all, it turned out to be a tasty dish, and I’ll continue to push myself to make my own creations rather than just follow others’. Maybe one day I’ll even graduate from the color-by-number coloring books. Here’s hoping.